My girlfriend and I recently took a roadtrip to northern Minnesota for a weekend. After an eternity in the car, we arrived to a land of trees, and giant lakes, and more trees. 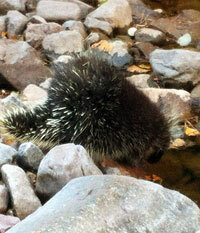 And porcupines. to an overly inquisitive dog. We got to spend a good portion of the weekend trampling through the woods with her dog, ducking under branches and stepping over fallen trees, breathing amazingly clean, crisp winter air, with leaves and dirt and sticks crunching under our boots. And then the weekend ended and we returned home, to a world of concrete and asphalt and car exhaust. No me gusta. After spending even one weekend just enjoying the beautiful outdoors and being free of any real responsibilities, coming back to a life of sitting at a computer all day was jarring and unwelcome and distasteful. Then I see an article about a 2,650 mile trail from Mexico to Canada that people take five months to hike, and it makes me sad because there’s no way I can take five months off of work to do something like that. (Not that I would survive that kind of hike right now anyway.) I don’t have anywhere near the kind of vacation day availability that such a trek would require. And I came to a realization. I am tired of having my life dictated by when I have to be back at work.